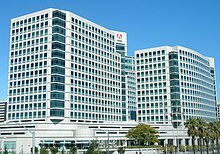 Adobe Inc. (/əˈdoʊbiː/ ə-DOH-bee) is an American multinational computer software company headquartered in San Jose, California. It has historically focused upon the creation of multimedia and creativity software products, with a more recent foray towards digital marketing software. Adobe is best known for its Adobe Flash web software ecosystem, Photoshop image editing software, Acrobat Reader, the Portable Document Format (PDF), and Adobe Creative Suite, as well as its successor Adobe Creative Cloud. Adobe logo from 1993 to 2017. Adobe entered NASDAQ in August 1986. Its revenue has grown from roughly $1 billion in 1999 to $4 billion in 2012. Adobe's fiscal years run from December to November. For example, the 2007 fiscal year ended on November 30, 2007. In December 1991, Adobe released Adobe Premiere, which Adobe rebranded as Adobe Premiere Pro in 2003. In 1992, Adobe acquired OCR Systems, Inc. In 1994, Adobe acquired Aldus and added PageMaker and After Effects to its product line later in the year; it also controls the TIFF file format. 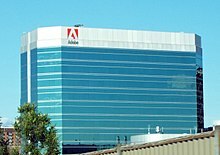 In the same year, Adobe acquired LaserTools Corp and Compution Inc. In 1995, Adobe added FrameMaker, the long-document DTP application, to its product line after Adobe acquired Frame Technology Corp. In 1996, Adobe Inc added Ares Software Corp. In 2002, Adobe acquired Canadian company Accelio (also known as JetForm). On December 12, 2005, Adobe acquired its main rival, Macromedia, in a stock swap valued at about $3.4 billion, adding ColdFusion, Contribute, Captivate, Adobe Connect (formerly Macromedia Breeze), Director, Dreamweaver, Fireworks, Flash, FlashPaper, Flex, FreeHand, HomeSite, JRun, Presenter, and Authorware to Adobe's product line. Adobe released Adobe Media Player in April 2008. On April 27, Adobe discontinued development and sales of its older HTML/web development software, GoLive in favor of Dreamweaver. Adobe offered a discount on Dreamweaver for GoLive users and supports those who still use GoLive with online tutorials and migration assistance. On June 1, Adobe launched Acrobat.com, a series of web applications geared for collaborative work. Creative Suite 4, which includes Design, Web, Production Premium, and Master Collection came out in October 2008 in six configurations at prices from about US$1,700 to $2,500 or by individual application. The Windows version of Photoshop includes 64-bit processing. On December 3, 2008, Adobe laid off 600 of its employees (8% of the worldwide staff) citing the weak economic environment. Adobe Systems Canada in Ottawa, Ontario (not far from archrival Corel). On November 10, 2009, the company laid off a further 680 employees. Adobe announced it was investigating a "coordinated attack" against corporate network systems in China, managed by the company. In January 2011, Adobe acquired DemDex, Inc. with the intent of adding DemDex's audience-optimization software to its online marketing suite. At Photoshop World 2011, Adobe unveiled a new mobile photo service. Carousel is a new application for iPhone, iPad, and Mac that uses Photoshop Lightroom technology for users to adjust and fine-tune images on all platforms. Carousel will also allow users to automatically sync, share and browse photos. The service was later renamed to "Adobe Revel". On November 9, 2011, Adobe announced that they would cease development of Flash for mobile devices following version 11.1. Instead, it would focus on HTML 5 for mobile devices. On December 1, 2011, Adobe announced that it entered into a definitive agreement to acquire privately held Efficient Frontier. On September 20, 2018, Adobe announced its acquisition of marketing automation software company, Marketo. On October 3, 2018, Adobe officially changed its name from Adobe Systems Incorporated to Adobe Inc.
Adobe has a five star privacy rating from the Electronic Frontier Foundation. Adobe has been criticized for its pricing practices, with retail prices being up to twice as much in non-US countries. As pointed out by many, it is significantly cheaper to pay for a return airfare ticket to the United States and purchase one particular collection of Adobe's software there than to buy it locally in Australia. On October 3, 2013, the company initially revealed that 2.9 million customers' sensitive and personal data was stolen in security breach which included encrypted credit card information. Adobe later admitted that 38 million active users have been affected and the attackers obtained access to their IDs and encrypted passwords, as well as to many inactive Adobe accounts. The company did not make it clear if all the personal information was encrypted, such as email addresses and physical addresses, though data privacy laws in 44 states require this information to be encrypted. A 3.8 GB file stolen from Adobe and containing 152 million usernames, reversibly encrypted passwords and unencrypted password hints was posted on AnonNews.org. LastPass, a password security firm, said that Adobe failed to use best practices for securing the passwords and has not salted them. Another security firm, Sophos, showed that Adobe used a weak encryption method permitting the recovery of a lot of information with very little effort. According to IT expert Simon Bain, Adobe has failed its customers and 'should hang their heads in shame'. Many of the credit cards were tied to the Creative Cloud software-by-subscription service. Adobe offered its affected US customers a free membership in a credit monitoring service, but no similar arrangements have been made for non-US customers. When a data breach occurs in the US, penalties depend on the state where the victim resides, not where the company is based. Published on a server of a Russian-speaking hacker group, the "disclosure of encryption algorithms, other security schemes, and software vulnerabilities can be used to bypass protections for individual and corporate data" and may have opened the gateway to new generation zero-day attacks. Hackers already used ColdFusion exploits to make off with usernames and encrypted passwords of PR Newswire's customers, which has been tied to the Adobe security breach. They also used a ColdFusion exploit to breach Washington state court and expose up to 200,000 Social Security numbers. Adobe acquired Aldus Corp. in 1994, a software vendor that sold FreeHand, a competing product. Freehand was direct competition to Adobe Illustrator, Adobe's flagship vector-graphics editor. The Federal Trade Commission intervened and forced Adobe to sell FreeHand back to Altsys, and also banned Adobe from buying back FreeHand or any similar program for the next 10 years (1994-2004). Altsys was then bought by Macromedia, which released versions 5 to 11. When Adobe acquired Macromedia in December 2005, it stalled development of Freehand in 2007, effectively rendering it obsolete. With FreeHand and Illustrator, Adobe controlled the only two products that compete in the professional illustration program market for Macintosh operating systems. In 2011, a group of 5,000 Freehand graphic designers convened under the banner Free Freehand, and filed a civil antitrust complaint in the US District Court for the Northern District of California against Adobe. The suit alleged that Adobe has violated federal and state antitrust laws by abusing its dominant position in the professional vector graphic illustration software market and that Adobe has engaged in a series of exclusionary and anti-competitive acts and strategies designed to kill FreeHand, the dominant competitor to Adobe's Illustrator software product, instead of competing on the basis of product merit according to the principals of free market capitalism. Adobe had no response to the claims and the lawsuit was eventually settled. The FreeHand community believes Adobe should release the product to an open-source community if it cannot update it internally. As of 2010[update], on its FreeHand product page Adobe stated "While we recognize FreeHand has a loyal customer base, we encourage users to migrate to the new Adobe Illustrator CS4 software which supports both PowerPC and Intel-based Macs and Microsoft Windows XP and Windows Vista." As of 2016[update], the Freehand page no longer exists and simply redirects to the Illustrator page. Adobe's software FTP server still contains a directory for FreeHand, but it is empty. ^ a b c "Adobe Inc 2018 Annual Report press release" (XBRL). Adobe Systems. December 13, 2018. ^ "Adobe Systems Inc 2018 Annual Report press release" (XBRL). Adobe Systems. December 13, 2018. ^ "Adobe Systems". Fortune. Retrieved December 20, 2018. ^ "Adobe Q1 FY2019 investor datasheet" (PDF). ^ Weber, Harrison (May 26, 2013). "Adobe Abandons Its Creative Suite to Focus on Creative Cloud". The Next Web. Retrieved July 8, 2014. ^ a b c "Adobe Fast Facts". April 16, 2019. Archived (PDF) from the original on March 26, 2009. Retrieved April 16, 2019. ^ Edwards, Benj (April 27, 2010). "Four reasons the LaserWriter mattered". MacWorld. Retrieved September 24, 2015. ^ Donnelly, Julie (September 17, 2013). "Adobe dumps gleaming Waltham digs at a $20M loss". Boston Business Journal. Retrieved May 17, 2017. ^ "India's best companies to work for 2017: Here's why interns love Adobe Systems". Retrieved December 20, 2018. ^ Rholetter, Wylene (2013). "Charles Geschke: Cofounder and cochairman of Adobe". Computer Technology Innovators. Ipswich, Massachusetts: Salem Press. pp. 104-. ISBN 9781429838054. ^ "Adobe Logo: Design and History". Famouslogos.net. Retrieved July 28, 2011. ^ Jager, Rama Dev (1997). In the company of giants: candid conversations with the visionaries of the digital world. New York: McGraw Hill. p. 105. ^ Menuez, Doug (2014). Fearless genius : the digital revolution in Silicon Valley, 1985-2000. New York: Atria Books. p. 45. ISBN 9781476752730. ^ Wawro, Thaddeus (2000). "Charles Geschke & John Warnock: the fathers of desktop publishing". Radicals and visionaries. Entrepreneur Press. p. 143. ISBN 1891984136. ^ Menuez, Doug (2014). Fearless genius : the digital revolution in Silicon Valley, 1985-2000. New York: Atria Books. p. 51. ISBN 9781476752730. ^ Wester, Edward (2000). "Chapter 6: The Eighties: PDLs, Adobe, and John Warnock". Print unchained: fifty years of digital printing, 1950-2000 and beyond: A saga of invention and enterprise. West Dover, VT: DRA of Vermont. p. 162. ISBN 0970261705. ^ Wawro, Thaddeus (2000). "Charles Geschke & John Warnock: the fathers of desktop publishing". Radicals and visionaries. Entrepreneur Press. p. 144. ISBN 1891984136. ^ Webster, Edward (2000). "Chapter 2: Overture: The Technologies". Print unchained: fifty years of digital printing, 1950-2000 and beyond: A saga of invention and enterprise. West Dover, VT: DRA of Vermont, Inc. p. 63. ISBN 0970261705. ^ "Adobe Incorporated Company Profile". Google Finance. ^ Verespej, Michael A. (February 5, 1996). "Empire without emperors". Industry Week. 245 (3): 13–16 – via ProQuest. ^ "Adobe gets font technology. (Adobe Inc. acquires Ares Software Corp.)". June 3, 1996. Archived from the original on October 11, 2013. Retrieved July 12, 2013. ^ "Adobe acquires Accelio. (Industry News)". July 1, 2002. Archived from the original on September 11, 2016. Retrieved July 27, 2016. ^ Graham, Jefferson (April 18, 2005). "Adobe buys Macromedia in $3.4B deal". USA Today. Retrieved March 31, 2007. ^ Martin LaMonica, CNET. "Now playing: Adobe Media Player 1.0." 11 April 2008. Retrieved Dec 12, 2016. ^ Larson, Erik (June 1, 2008). "Welcome to Acrobat.com – Work. Together. Anywhere". Adobe. Archived from the original on June 3, 2008. Retrieved June 2, 2008. ^ "Adobe launches Creative Suite 4; Likely to top low expectations". ZDNet. CBS. September 23, 2008. Archived from the original on September 24, 2008. Retrieved September 23, 2008. ^ a b Carlson, Jeff (September 23, 2008). "Adobe Announces Vast Creative Suite 4". TidBITS. Archived from the original on September 28, 2008. Retrieved September 23, 2008. ^ Morrison, Scott (November 10, 2009). "Adobe Will Cut 680 Jobs to Reduce Costs". Wall Street Journal. Retrieved November 9, 2010. ^ "Adobe Targeted by Cyber Attack from China". DailyTech. Archived from the original on May 25, 2010. Retrieved May 29, 2010. ^ "Apple vs. Adobe". networkworld.com. June 7, 2010. Archived from the original on June 13, 2011. Retrieved July 28, 2011. ^ "Thoughts on Flash". Apple. Retrieved July 10, 2012. ^ "Adobe Buys Day Software". July 28, 2010. Retrieved January 16, 2012. ^ "Adobe CQ WEM". February 22, 2011. Retrieved January 16, 2012. ^ "Adobe CQ DAM". February 22, 2011. Retrieved January 16, 2012. ^ "Adobe CQ Social Collaboration CQ SOCO". February 22, 2011. Retrieved January 16, 2012. ^ "Adobe CQ Mobile". February 22, 2011. Retrieved January 16, 2012. ^ Leena Rao (January 18, 2011). "Adobe Buys Behavioral Data Management Platform DemDex". TechCrunch. Retrieved April 20, 2015. ^ a b c Darrell Etherington, GigaOm. "Adobe tries mobile photos as a service with Carousel." September 7, 2011. Retrieved September 12, 2011. ^ John Nack on Adobe: Adobe Carousel renamed "Adobe Revel". Blogs.adobe.com (2012-01-11). Retrieved on 2013-07-21. ^ "Adobe acquires Canadian makers of PhoneGap, Nitobi". IT World Canada. October 11, 2011. Retrieved May 12, 2017. ^ Winokur, Danny (November 9, 2011). "Flash to Focus on PC Browsing and Mobile Apps; Adobe to More Aggressively Contribute to HTML5 (Adobe Featured Blogs)". Blogs.adobe.com. Retrieved December 24, 2011. ^ "Adobe Buys Efficient Frontier to Boost Its Online Advertising Capabilities". Retrieved December 1, 2011. ^ Lee, Jasen (December 6, 2012). "A look inside Adobe's new state-of-the-art Utah home". Deseret News. ^ "Adobe hack much worse than reported, hits 38 million passwords and Photoshop source code". The Verge. Retrieved March 7, 2017. ^ "Over 150 million breached records from Adobe hack have surfaced online". The Verge. Retrieved March 7, 2017. ^ "Judge Grants Class-Action Status in Silicon Valley Hiring Suit - WSJ.com". Online.wsj.com. October 25, 2013. Archived from the original on October 29, 2013. Retrieved October 30, 2013. ^ McLean, Asha. "Adobe and Nvidia expand partnership for Sensei AI | ZDNet". ZDNet. Retrieved April 4, 2018. ^ "Adobe buys Magento for US$1.68b to target e-commerce". The Business Times. Retrieved May 23, 2018. ^ "Adobe to buy Magento for $1.68 billion". CNBC. Retrieved May 23, 2018. ^ "Adobe gets its company, snaring Marketo for $4.75 billion". TechCrunch. Retrieved September 22, 2018. ^ U.S. Securities and Exchange Commission. "Ownership Information: ADOBE INC". SEC.gov. Retrieved November 21, 2018. ^ "Adobe Systems Inc. - AnnualReports.com". www.annualreports.com. Retrieved November 25, 2018. ^ Thiadmer Riemersma (July 2, 2012). "The Filmstrip file format". CompuPhase. Retrieved January 27, 2015. ^ "Adobe Spark - Create Animated Videos, Web Stories, and Social Graphics in Minutes". Adobe Spark. May 19, 2016. ^ "Adobe Completes Acquisition of Fotolia" (Press release). Adobe Systems Inc. January 28, 2015. Retrieved March 17, 2015. ^ "Adobe debuts new AI-powered features in Adobe Experience Platform". VentureBeat. March 26, 2019. Retrieved March 27, 2019. ^ "100 Best Companies to Work For 2009". CNN. ^ "Who Has Your Back? Government Data Requests 2017". ^ "Adobe responds to CS4 pricing criticism". ^ "Adobe defends CS4 pricing". Archived from the original on September 27, 2011. ^ "Adobe responds to customer protests against perceived unfair pricing". ^ "Don't Believe The Adobe Price Cut Hype, It's Still Gouging You Silly". Gizmodo. Retrieved March 7, 2017. ^ "Adobe has its head in the clouds over pricing". Melbourne: The Age - Technology. Retrieved March 7, 2017. ^ "UK will pay £1,000 more for Adobe CS3". ZDNet. March 30, 2007. Retrieved May 23, 2014. ^ "10,000 sign Adobe CS3 European pricing petition". Photo.net. May 20, 2007. Retrieved May 23, 2014. ^ "Adobe hikes UK prices by 10% | News". PC Pro. June 1, 2009. Retrieved May 29, 2010. ^ Charles Arthur (June 3, 2009). "Adobe widens the price gap". London: The Guardian. Retrieved May 23, 2014. ^ Gary Marshall. "The 10 most hated programs of all time: Terrible software that made everybody see red". TechRadar. Retrieved October 5, 2017. ^ Pagliery, Jose (October 8, 2013). "Adobe has an espically abysmal security record - CNNMoney". Money.cnn.com. Retrieved May 23, 2014. ^ Aug 17, 2011 by Jeff James in Security Blog (August 17, 2011). "Adobe Fares Poorly in Kaspersky Lab Security Report". WindowsITPro. Retrieved May 23, 2014. ^ "Adobe Spying On Its Customers". Techdirt. December 28, 2007. Retrieved May 23, 2014. ^ "John Nack on Adobe: Adobe ate me baby!!". Blogs.adobe.com. December 28, 2007. Retrieved May 23, 2014. ^ Brewster, Thomas (May 14, 2012). "Adobe Backtracks On Patching 'PR Disaster'". TechWeekEurope. Retrieved May 23, 2014. ^ Brenner, Bill (May 14, 2012). "That was stupid, Adobe | CSO Blogs". Blogs.csoonline.com. Archived from the original on June 30, 2012. Retrieved May 23, 2014. ^ "Adobe and Skype top my Foistware Hall of Shame". ZDNet. April 28, 2011. Retrieved May 23, 2014. ^ "Adobe's latest critical security update pushes scareware". ZDNet. March 29, 2012. Retrieved May 23, 2014. ^ "Adobe in source code and customer data security breach". BBC. October 4, 2013. Retrieved May 23, 2014. ^ "Adobe accounts hacked, data exposed for 2.9 million customers - Digital Photography Review". ^ King, Rachel. "Adobe hacked, 3 million accounts compromised | Security & Privacy - CNET News". ^ "Adobe hack attack affected 38 million accounts | Security & Privacy - CNET News". News.cnet.com. Retrieved May 23, 2014. ^ "Adobe security breach actually affected closer to 38 million users". ZDNet. ^ "Adobe Cyber Attack was a Lesson for Corporations - Kioskea.net". October 29, 2013. Archived from the original on October 22, 2013. Retrieved May 23, 2014. ^ Konrad, Alex. "After Security Breach Exposes 2.9 Million Adobe Users, How Safe Is Encrypted Credit Card Data?". Forbes. Retrieved May 23, 2014. ^ Goodin, Dan (November 1, 2013). "How an epic blunder by Adobe could strengthen hand of password crackers | Ars Technica". Arstechnica.com. Retrieved May 23, 2014. ^ Finkle, Jim (November 7, 2013). "Trove of Adobe user data found on Web after breach: security firm | Reuters". Uk.reuters.com. Retrieved May 23, 2014. ^ "Adobe confirms stolen passwords were encrypted, not hashed - CSO Online". ^ Published on 5th November 2013 by Gareth Halfacree (November 5, 2013). "Adobe data breach far worse than first claimed". bit-tech.net. Retrieved May 23, 2014. ^ Smith, Matt (November 5, 2013). "Adobe 'should hang their heads in shame' following cyber attack". Business Technology. Retrieved May 23, 2014. ^ "Adobe hack shows subscription software vendors lucrative targets | Computerworld". ^ "Massive Adobe Security Breach: Change Your Passwords Now | Lifehacker Australia". ^ "Adobe Treating Australians As Lesser Beings Even After Details Of 2.9 Million Accounts Were Stolen | Gizmodo Australia". ^ "Adobe says breach notification taking longer than anticipated | Reuters". November 25, 2013. ^ "Adobe fesses up to hack but fudges on details | Application security - InfoWorld". ^ "BBC Adobe Hacked: Cyber-Thieves Accessed Credit Card Information Of Nearly 3 Million Customers". Huffington Post. October 4, 2013. Archived from the original on October 4, 2013. ^ Kocieniewski, David (October 3, 2013). "Adobe Announces Security Breach | The New York Times". ^ "Ruh-roh: Adobe breach is just the beginning, researcher says". Gigaom.com. October 7, 2013. Retrieved May 23, 2014. ^ "BBC News - Adobe hack: At least 38 million accounts breached". Bbc.co.uk. October 30, 2013. Retrieved May 23, 2014. ^ "Why the Adobe Hack Scares Me - And Why It Should Scare You | Adam Levin". Huffingtonpost.com. November 15, 2013. Retrieved May 23, 2014. ^ "Adobe's source code was parked on hackers' unprotected server | PCWorld". ^ "Hackers breached Washington state court with Adobe ColdFusion flaw | ZDNet". ^ a b c d e f g h Rivoli, Dan (May 3, 2011). "Adobe Hit With Class Action Over FreeHand App". Law360. ^ a b c d e f Snol, Lexton (May 5, 2010). "Adobe accused of software monopoly (not by Apple)". Tech World. ^ a b "Adobe sued by FreeHand user group". Computerworld UK. May 18, 2011. ^ a b Nelson, Jay (May 3, 2011). "Adobe Sued for Killing FreeHand". Planet Quark. ^ a b "FreeHand users sue Adobe for 'killing' the application". Macworld. May 18, 2011. Wikimedia Commons has media related to Adobe Systems. "Adobe timeline" (PDF). Archived from the original (PDF) on July 2, 2007.